AntiSpyGuard is one of the latest spyware infections plaguing users on the Internet. 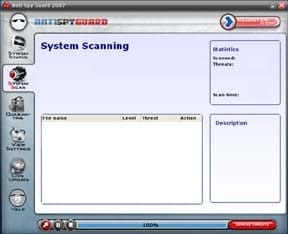 AntiSpyGuard is a particularly difficult piece of spyware to remove from your computer, and while there are many spyware and security forums out there that show you how to remove AntiSpyGuard, this is the only complete set of remove AntiSpyGuard instructions available that will not involve spending money or buying a product. This remove AntiSpyGuard tutorial will show you how to remove AntiSpyGuard from your computer. AntiSpyGuard is described by its maker as one of the”most effective protection solutions. It is the most advanced Spyware detection and removal application on the Internet available.” You may have intentionally or unintentionally installed the AntiSpyGuard software on your computer by clicking an advertisement on a web page. NOTE: It is important that you follow the directions on the following pages EXACTLY to ensure you rcompletely remove AntiSpyGuard from your computer. Skipping steps, or performing actions out of sequence will result in a failure to completely remove AntiSpyGuard and could result in spyware reinfection. Please click here to bookmark this page (Ctrl+D) so you can return here later. This remove AntiSpyGuard process will require you to restart your PC. Most of the time it is easy to know when you need to remove AntiSpyGuard from your computer. When your system is infected with AntiSpyGuard, you will see a pop-up each time you boot your computer similar to the ones above. You will also see almost constant popups that appear to be coming from the Windows Security Center by your system’s clock. These are generated by AntiSpyGuard. The main purpose of AntiSpyGuard is to try and trick you into thinking that your computer is massively infected with spyware, and the only solution is to purchase the commercial version of AntiSpyGuard to remove the infection. In reality, AntiSpyGuard is the spyware infection, and the typical AntiSpyware utilities (Adaware, Spybot Search and Destroy, Microsoft AntiSpyware, and Windows Defender) can not remove AntiSpyGuard because AntiSpyGuard is constantly running – even in Safe Mode. This tutorial will show you how to completely remove AntiSpyGuard from your computer in three easy steps. Use the links below to continue to the next page of this tutorial. The entire remove AntiSpyGuard tutorial should take less that five minutes, and is not difficult for a computer novice to complete. Remove AntiSpyGuard Step 1 – With the introductions out of the way, you will now need to download the tools required to remove AntiSpyGuard from your computer. There are two tools that are needed. Use the links below to download each AntiSpyGuard removal tool and save it to your Windows desktop. Right click on each link and select “Save Target As” and save them to your desktop. You will need both tools to completely remove AntiSpyGuard. Remove AntiSpyGuard Step 2 – Once you have these two tools downloaded, you need to install a secure a secure web browser, such as Firefox. You were infected with the AntiSpyGuard spyware when its creators manipulated your Internet Explorer browser. To successfully remove AntiSpyGuard you must download and install the Firefox browser! After installing Firefox it is critical that you run the Firefox browser at least once. This is important! Don’t skip this step! Remove AntiSpyGuard Step 3 – Once you’ve downloaded, installed and opened Firefox, next you will need to prepare prepare your other tools for use. To do this, first locate the smitrem.exe file on your desktop. Double click on the file and you will see an extraction window similar to the one on the right. Click on Start and the extractor will create a folder on your desktop called smitrem. Next, locate the FixSQ.zip file on your desktop, and double click it to extract the FixSQ.reg file to your desktop. Once these two files are on your desktop, reboot your computer into Safe Mode. Once your system is rebooted the infection alerts will continue. Do not be alarmed. You are now ready to remove AntiSpyGuard. You are now half-way done with the remove AntiSpyGuard tutorial. Please use the links below to continue on to the next set of AntiSpyGuard removal instructions. NOTE: We strongly suggest that you disable System Restore before continuing to remove AntiSpyGuard. Old scraps of the AntiSpyGuard software may be stored in your System Restore points. Use the links below to view a help article on disabling System Restore that is appropriate for your Operating System. AntiSpyGuard Removal Step 4 – Once your computer is in Safe Mode you can proceed with the tools you prepared to remove AntiSpyGuard from your computer in the previous step. Open your Control Panels and double click on Add/Remove Programs. Once the Add/Remove window is open, locate the AntiSpyGuard entry (they are in alphabetical order) and click uninstall to remove AntiSpyGuard. If you do not find the AntiSpyGuard removal entry it is possible that another anti-spyware program has already removed it. If this is the case, continue to follow the remove AntiSpyGuard tutorial to ensure a full removal. NOTE: The AntiSpyGuard program will still be popping up those annoying alerts from your taskbar. This is normal. Continue through the rest of the tutorial to complete the remove AntiSpyGuard tutorial. AntiSpyGuard Removal Step 5 – Next, you are going to use one of the tools you downloaded. Find the FixMC.reg file on your desktop and double click on it. Say “Yes” to any security warnings that pop up. This file modifies your computer’s registry. Once it is done working, it should say that items have been successfully added to the registry. Now we will use the second tool you downloaded. Locate the smitrem folder on your desktop and double click on it to open it. Locate a file in the folder named “runthis.bat” and double click on it to launch it. Click “Yes” on any security warnings that pop up. This tool will take a little time to remove AntiSpyGuard infection components. As the AntiSpyGuard removal process works, it will periodically tell you what it is doing. Follow the on-screen directions to move through the smitrem tool. When it is done it will run a disk cleanup. This can take anywhere from minutes to hours to run, so be patient and allow it to complete. You are almost done with the remove AntiSpyGuard process! There is only one step left to complete the tutorial. Please use the links below to navigate to the last tutorial page. AntiSpyGuard Removal Step 6 – Once the smitrem tool has finished, the bulk of the remove AntiSpyGuard process is complete. We now have to stop those annoying alert popups from appearing so we can delete the AntiSpyGuard files that create them. To do this, press the “ctrl” + “alt” + “del” keys on your keyboard at the same time to enter the Task Manager. Click on the “Processes” tab. You are now looking at a list of every process running on your computer. One (or more) of them is causing the AntiSpyGuard popups to appear on your screen. Look through the list of running processes on your computer and compare it to the processes below. If you find any matches, highlight the process and click the “End Task” button. Once you have ended the task, the popup virus alerts should stop and the icon creating them should disappear from your system tray. AntiSpyGuard Removal Step 7 – Now you have to look for some AntiSpyGuard files and attempt to remove them. There are many variants of AntiSpyGuard, so you may find some of these files, all of them, or none of them. Click on Start and then click on Run. In the Run box type “c:\windows\system32” without the quotes and press the OK button. If the window that opens says that the files are hidden, click on Show the Contents of the folder. Look for any of the AntiSpyGuard files listed below and remove them. It is easiest if you switch your folder view to “List” for this process. SpyFalcon Removal Step 8 – Now you can reboot your computer to exit Safe Mode. The remove AntiSpyGuard tutorial is now complete and your computer should be free of those annoying popups. Please feel free to use the links below to review the remove antispyguard tutorial.